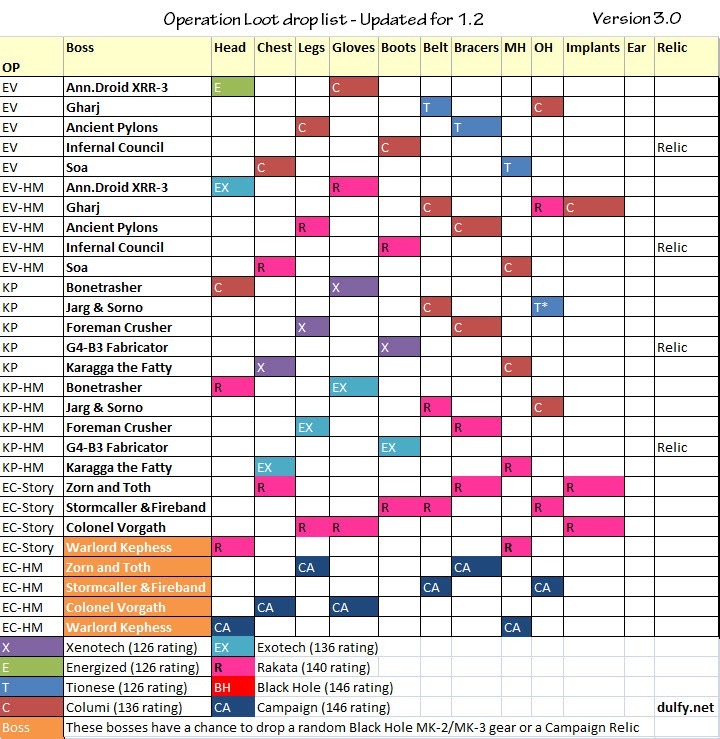 NOTE: This loot list only covers EV/KP/EC see this list for all operations. Black Hole: New tier of gear in 1.2, has three tiers: MK-1, MK-2, and MK-3. MK-1 is available for purchase via Black Hole Commendations while MK-2 and MK-3 are drops from Storymode EC last boss and Hardmode EC. Has set bonus. Campaign gear: New tier of gear in 1.2. Obtained from Hardmode EC. Has identical set bonus to Rakata. Pattern for EV/KP: 5 bosses per operation instance, each operation boss drops loot of two tier grades (Columi/Tionese for normal, Rakata/Columi for hardmode/nightmare). 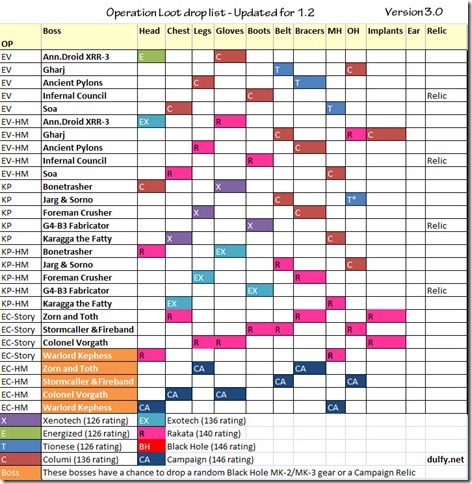 The two operations have loots that are complement of each other, meaning that each boss in the two operations will drop the same pieces, with the grades switched around (i.e. Boss 1 of EV and KP both drops gloves and headpieces. in EV HM, you have Rakata gloves and Exotech headpiece. In KP-HM, you have Exotech gloves, and Rakata headpiece). Info for Hardmode EC came from various posters on swtor.com, commenters on dulfy.net and also guild <Rutilus Nex> on The Twin Spears Server. Thank you for the info! Another excellent resource! Thanks much! Energized/Xenotech appears togheter I think, I dropped Energized’s Gloves from Bonethrasher in normal mode, anyway great guide! People keep saying only Black Hole pants drop from the end of Story Mode EC. We didn’t have any pants, but a chest dropped. Hm kephess a mainland not offhand? Explosive Conflict Story Mode: Kephess drops Black Hole MK1 gloves and chest confirmed. Not sure what else he may drop as those are the only two Black Hole items we saw. the crystal is not specific to any boss, we had it drop off the bonus chests lying around the instance as well. Yep, snagged my purple/black in the chest just after Tanks. where do campaign boots drop?? Dulfy since you are the king/queen of making awesome guides for FPs and Loot I was wondering if you had an Explosive Conflict guide in the works anytime soon??? http://mmo-mechanics.com/swtor/forums/Forum-Tier-2-Operations although the info there is kinda scattered and some stuff are not really accurate. You sort of have to read multiple posts from different people etc to get the big picture. http://troopercommando.com/ also have some strats etc but the thing is they don’t go into detail into the stuff that will likely wipe you raid – i.e. stuff like how to counter gift of the masters on hardmode Kephess etc. Alright thats what Im talking about…Much appreciated Dulfy!!! dulfy do lvl 61 mods drop in hm ec like the 58 mods drop in hm kp and ev? Are you going to add the TFB drops list in the table? I pull a trooper main hand rakata weapon out of EV on hard.